the family DNA in every cell of your body. the use of DNA "testing" in combination with traditional genealogical methods to infer relationships between individuals and find ancestors. "Testing" does not mean just sending a DNA sample to a laboratory; it means using DNA to test a specific hypothesis derived from traditional genealogical methods. The DNA companies are not "testing companies" or "testing laboratories" - they just provide the tools for the genealogist to test his or her own hypotheses. The genealogist must organise all the relevant information (oral and paper-based, private and public, traditional and DNA) in an easily searchable lineage-linked computer database format. e.g. Ancestral Quest, which I use, or RootsMagic or Reunion or Family Tree Builder or any of the numerous other programs listed on Wikipedia; or even in the "cloud" (if you have superfast broadband and believe that clouds never evaporate, or have a good backup policy). The database can be uploaded from time to time to a website if desired, and the part detailing your direct ancestors must be uploaded in conjunction with your DNA data. produced as a separate stand-alone end product, using the database as a guide. We are the first generation to create digital records of our DNA. The value of DNA comparison to genealogists increases dramatically with the number of people from the relevant geographical area and relevant extended family group already in the DNA databases used. See chart and report on database sizes (which does not stress the U.S. bias in most of the databases). We still need to persuade more known and possible Irish relatives to submit DNA samples to the databases for purely genealogical purposes. Your descendants will be eternally grateful to you for leaving them your DNA. Do unto them as you wish your ancestors had done unto you. Your own DNA (and especially the DNA of any living parents or grandparents) is one of your most important genealogical sources. Deciding not to use your DNA is now the equivalent of deciding not to use census returns. DNA has let the genie out of the bottle as regards secret adoptions and fosterings. If you want family secrets to remain family secrets, then you need to keep your immediate family members out of DNA comparison databases - including the future children and grandchildren of any unborn children that you desert (see case study below). Treat family secrets and those directly involved as sensitively and sympathetically as possible. This session will teach you methods to get the most out of your DNA as a source. to find hints and leads from the online DNA databases to other surviving sources. You will find groups of DNA matches whose most recent common ancestor (MRCA) with you may be just over the present brick walls in your family tree. Research has established that people whose ancestors lived close to each other geographically are now themselves close to each other genetically. The converse is not necessarily true: people from Place A may share DNA with people from Place B, but their most recent common ancestors may have lived in Place C.
The correlation between genes and geography allows the DNA companies to peddle estimated ethnicity percentages, almost inevitably presented without any mention of the associated margin of error. The DNA companies are still looking for GAA people (people with Geographically Anchored Ancestry) to form reference populations and provide improved estimates. Where does our DNA come from? enough random variation over hundreds of thousands of years to result in wide variations in the DNA signatures observed today. When a sperm fertilises an egg, each brings DNA, which is replicated in every cell of the resulting person. Only males have a Y chromosome. Y-DNA comes down the patrilineal line - from father, father's father, father's father's father, etc. 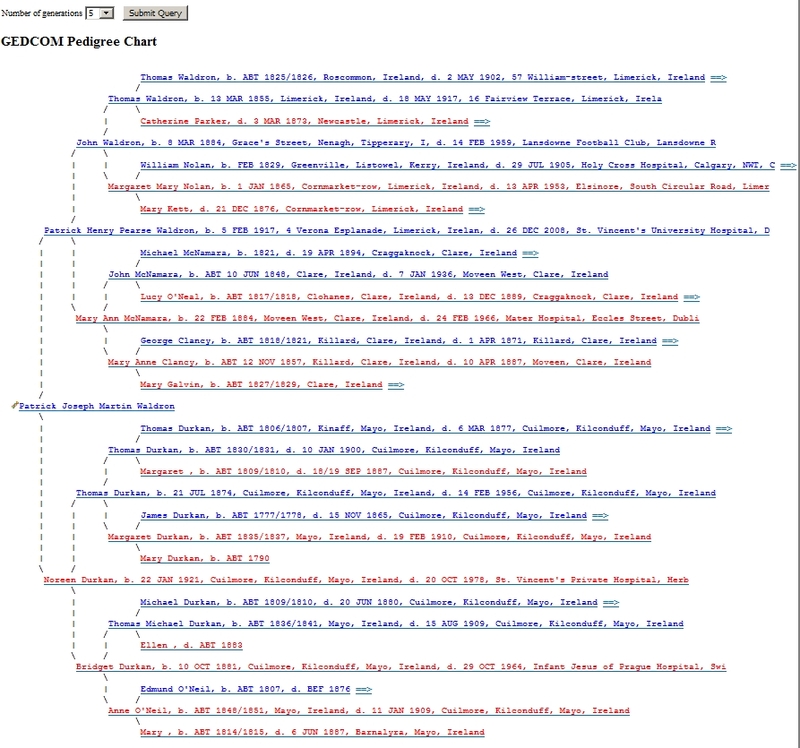 This is the same inheritance path as followed by surnames, grants of arms, peerages, etc. Males have one X chromosome, females have two. X-DNA may come through any ancestral line that does not contain two consecutive males. 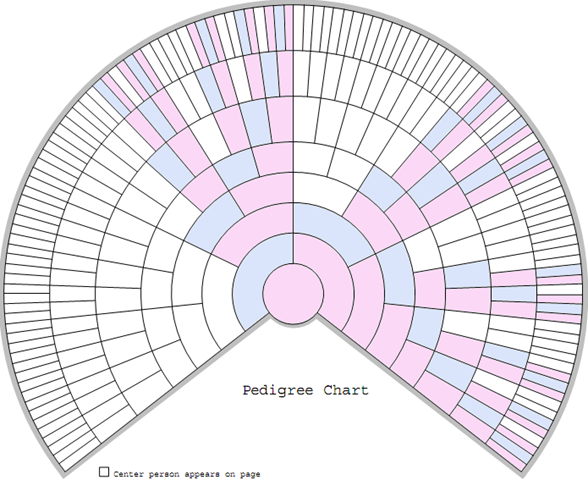 Blaine Bettinger's colour-coded blank fan-style pedigree charts show the ancestors from whom men and women can potentially inherit X-DNA. Exactly 50% of autosomal DNA (atDNA) comes from the father and exactly 50% comes from the mother. 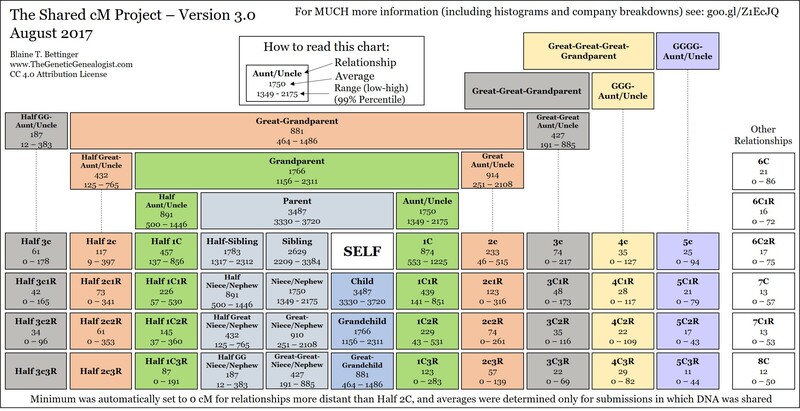 Due to recombination, on average 25% comes from each grandparent, on average 12.5% comes from each greatgrandparent, and so on. In extreme cases, an individual can inherit up to 35% from one paternal grandparent and, hence, as little as 15% from the other paternal grandparent. Siblings each inherit 50% of their parents' autosomal DNA, but not the same 50% (except for identical twins). Similarly, siblings each inherit 50% of their mother's X-DNA, but not the same 50% (except for identical twins). Sisters each inherit 100% of their father's X-DNA. Everyone has mitochondrial DNA (mtDNA). Mitochondrial DNA comes down the matrilineal line - from mother, mother's mother, mother's mother's mother, etc. The surname typically changes with every generation in this line. Autosomal DNA is the cheapest component to analyse and has rapidly become the most widely used in genealogy. Y-DNA has been widely used for one name studies or surname projects for much longer, but has also seen rapid recent scientific advances. Targeted mitochondrial DNA and X-DNA comparisons can be used to solve more specialised problems. Mutations are the first type of random variation in the inheritance process (of all four components of DNA), and are like transcription errors, e.g. a single A in the parent may be replaced by a C in the child. Some locations mutate very frequently (every couple of generations), and can be used to identify individuals beyond reasonable doubt, e.g. in criminal cases. Some locations mutate less frequently (only once in many generations or once in the history of mankind), and can be used to identify closely or distantly related individuals. Short Tandem Repeat (STR): a string of letters consisting of the same short substring repeated several times, for example CCTGCCTGCCTGCCTGCCTGCCTGCCTG is CCTG repeated seven times; it may be repeated less or more often in other individuals. Single Nucleotide Polymorphism (SNP): a single location where two (or occasionally more than two) different letters are observed in different individuals. The Y chromosome is passed virtually unchanged from father to son. 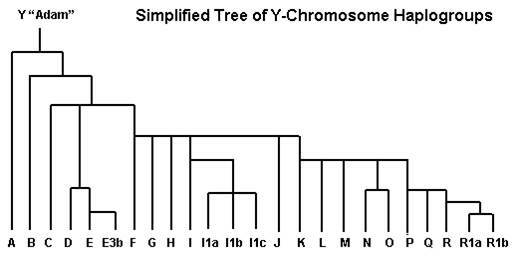 Early Y-DNA analysis looked at the numbers of repeats for each of 12 STR markers on the Y chromosome. Now Surname Projects look at 111 STRs. The state-of-the-art Big Y-700 product reports values for 700+ STRs. Genetic distance between two men is, roughly speaking, the number of differences between their STR signatures, e.g. 0/12 or 9/111. The smaller the genetic distance between two men, the closer their expected relationship. until the next STR mutation occurs, all descendants of the subject of the mutation are genetic distance 0/37 from their most recent common ancestor. Some SNP mutations on the Y chromosome are once-in-the-history-of-mankind events and can be used to build a Y-DNA Haplotree, which has evolved from the original Simplified Tree of Y-Chromosome Haplogroups (top level haplogroups A-R are about 20,000 years old). Surname-specific SNPs are now being discovered. These are the locations known to have SNP mutations. Recombination is the second type of random variation in the inheritance process (of autosomal DNA and maternal X-DNA only) and is how, e.g., the father's paternal and maternal autosomes cross over to produce the child's paternal autosomes. Every sperm and egg is potentially unique. Recombination of the paternal and maternal chromosomes is sometimes compared to shuffling two decks of playing cards. Recombination rates vary markedly along the autosomes and the X chromosome. The local recombination rate is referred to as genetic length and is measured in units called centiMorgans, which estimate the number of generations to the common ancestor of two individuals sharing an identical long run of letters. One recombination per generation is expected in each 100 centiMorgans (cM, not cm). The greater the genetic length of the DNA shared by two individuals, the closer the expected relationship. The correlation between shared centiMorgans and degree of relationship is not perfect. You can combine your DNA and your known ancestry to help your long-lost cousins to find you and to find your and their long-forgotten ancestors on several websites. 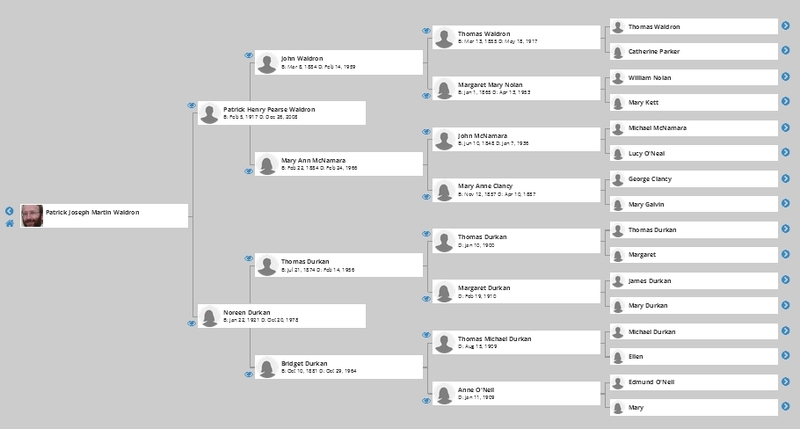 Export a GEDCOM file containing at least the ancestors of each DNA subject and upload it to all the DNA websites so that matches can see a pedigree chart. 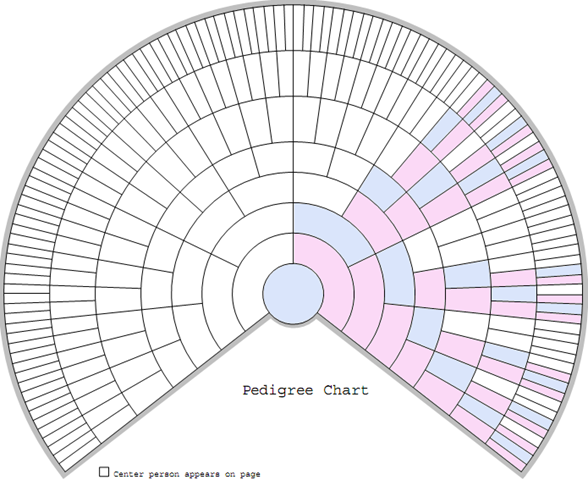 Examples of pedigree charts: from Ancestral Quest, AncestryDNA, ancestry.com, FamilyTreeDNA and GEDmatch. 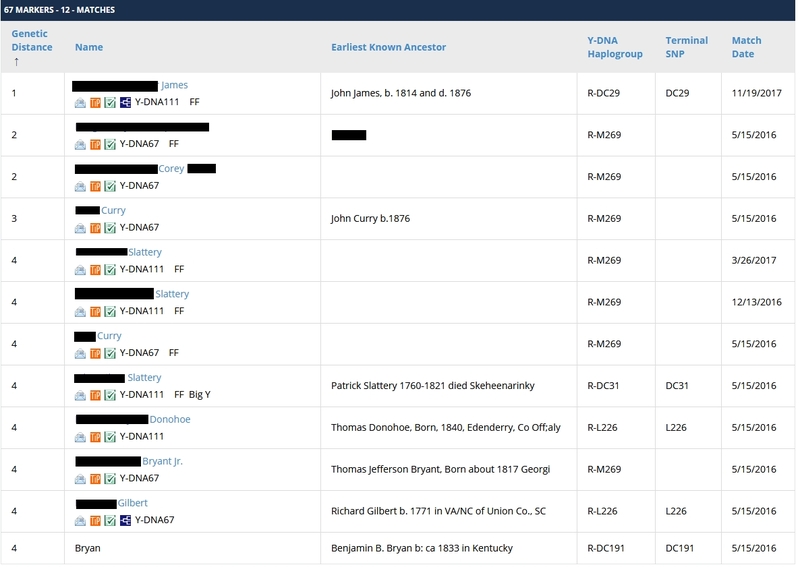 For FamilyTreeDNA.com, include in the GEDCOM file any third cousins or closer already at FTDNA and the shared ancestors; FTDNA will use these linked relationships to assign other matches to the DNA subject's paternal and maternal sides (example). Most people inherit DNA with their birth surname, so identify yourself as a minimum by your birth surname with an initial or a title, e.g., P Waldron or Mr Waldron or Miss Durkan. Valuable additional inferences can potentially be drawn once it is known whether two X chromosomes (female) or one X chromosome and one Y chromosome (male) are potentially available for comparison. Women do not have Y-DNA and are encouraged to recruit their male relatives to provide Y-DNA, but they must NOT attach a female name to a male DNA sample, as this causes untold confusion. Be especially careful not to inadvertently link a male's Y-DNA results with a female's autosomal DNA results at FamilyTreeDNA.com where error-checking does not look for this. Also take care not to link a male DNA sample to a female's pedigree chart (or vice versa). Your first name, married surname, adopted surname or marital status reveal nothing about your DNA, so you may keep these private if you wish. They reduce the chances that your matches will bother to look at your family tree, contact you or share the information about your ancestry that they have and that you do not have. Use the internal messaging system and AncestryDNA/MyHeritage/23andMe or Facebook messages only to exchange e-mail addresses. Pádraig Máire Neans (b. Abt 1826/9, d. 1907) and Tomás Máire Neans (b. Abt 1838/41, d. 1921) are remembered in the oral tradition as two Lynch brothers living across the road from each other in Moveen West. They survived the Great Famine in Moveen. Their mother Máire is remembered as one of two sisters between whom an O'Dea farm was divided - Mrs Lynch and Mrs O'Connell. In Griffith's Valuation in 1855, Mary Lynch (apparently widowed) and Patrick Lynch (recently married) are listed as occupiers. Daniel is buried in St. Rose's Cemetery in Sandy Hook. 20 June 2016: Donation from the diaspora to Clare Roots project "to go towards the test cost for a descendant of the Moveen West Lynch families". 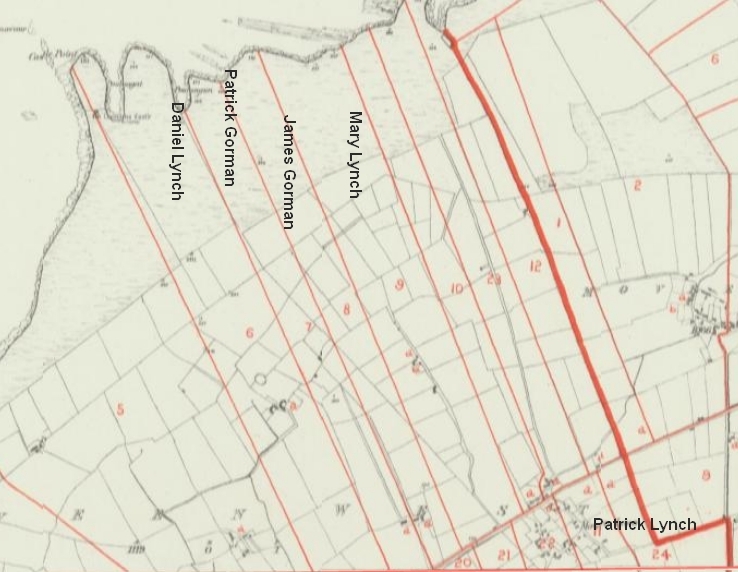 Around the same time, the Lynch siblings of Sacramento began to show up as autosomal DNA matches to "all the usual suspects" - people with roots on the Loop Head peninsula in West Clare. Because our grandfather, Eugene Lynch, is such a mystery to us we really don't know how to find him. All we have for certain is the 1910 census. It says he came over in 1887. The story is this: Eugene married my grandmother in San Jose in 1904 and they lived in Sacramento. He abandoned her and their children in 1909 [sic] when my grandmother was pregnant with my father. We didn't really know anything about him until we started doing this genealogy. We knew [sic] he died in San Francisco in 1917 but were surprised to discover that he was the captain of a schooner at the time. Claire and Ed are fourth cousins, descended from Mrs Lynch and Mrs O'Connell respectively. So their 50.2 centiMorgan half-identical region must contain an O'Dea segment. Michael is Eugene Lynch's grandson, so Michael must be related to Mr O'Dea (first name still unknown) or Mrs O'Dea (Neans) or descend from both. Eugene's surname is Lynch, so he must descend from Michael Lynch and Mary O'Dea. Eugene (41 in 1910) is too young to be Michael and Mary's son (their known children have implied birth years 1824-1841). Eugene's baptism is not the parish registers, which survive from 1852. Eugene's descendants share too much DNA with other descendants of Michael Lynch and Mary O'Dea for him to be their greatgrandson. So he must be their grandson. 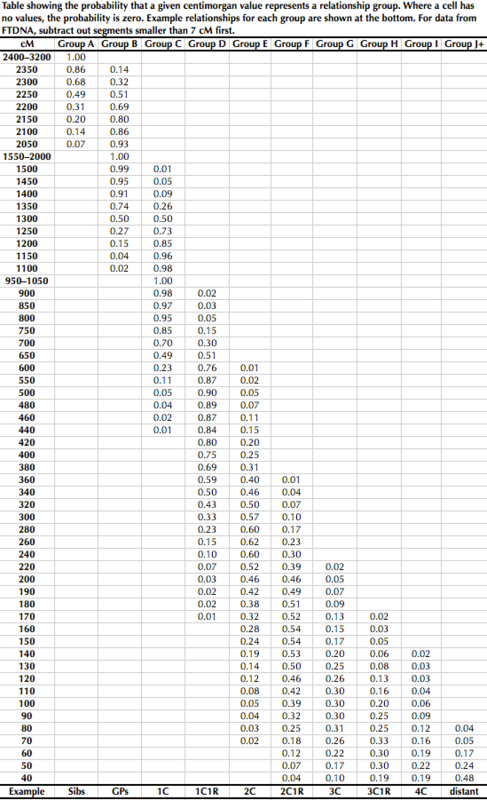 Even this implies a somewhat implausibly large 209.5cM shared between 3C1R - see Autosomal Matrix Comparison and Table of Probabilities. That day was the highlight of our trip to Ireland, and for me it was an unbelievable gift. I have been wondering and imagining for so long about my grandfather's (and thus my own) origins that I still quite can't believe I went there. It was a profound and moving experience for me. My sister Pat and I speak of it often ... It was magical to us. Both of my parents were from families who didn't stay connected with their homeland, and this journey has really fulfilled a need that I hadn't realized I had. I'll be forever grateful to Tom Kearney for introducing me to you, and to you for so generously sharing your expertise with us. For over two years, we swabbed various descendants of the known sons of Michael Lynch and Mary O'Dea in search of closer matches and of further clues, but failed to identify Eugene Lynch's father. 8 March 2019: The Sacramento Lynches return to Moveen (Facebook post). An epiphany on the road to Kilkee - a new hypothesis to be tested: Could Eugene have taken his mother's surname? No sign of a Eugene Lynch born to a single mother in the local workhouse. 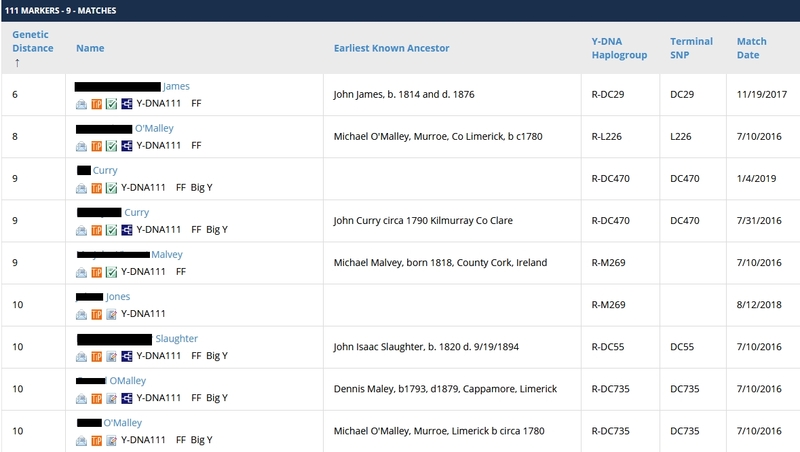 We have analysed autosomal DNA matches extensively, but did we ever check Michael Lynch's Y-DNA matches? The Y-DNA and the surname both follow the male line, unless there is a surname/DNA switch. Two Currys out of nine Y-DNA111 matches. Four more Coreys or Currys (including an adoptee), none of whom has bought Y-DNA111, in his top 12 Y-DNA67 matches. Surname spellings also mutate, independently of DNA mutations. Corey, Corry, Curry, O'Curry, Ó Comhraí should all have the same Y-DNA signature; likewise Lynch, Lindsey, Lynskey, Lynchahaun, Lynchaghaun, etc. Could Eugene Lynch really be another Eugene O'Curry? The DNA evidence often fills gaps in the traditional evidence, but sometimes refutes it. His famous namesake reputedly descends from the O'Currys of Lisluinaghan (see partly evaporated Rootsweb post). Pat Corry from Lisluinaghan witnessed the shotgun wedding of Michael Lynch of Moveen in 1882 - were they first cousins? Or even double first cousins? the family lore passed down has always been that "Eugene Curry “went west” to find his fame and fortune and would send for his family at a later date. He was never heard from again." 209.5cM shared between 2C1R makes a lot more sense than 209.5cM shared between 3C1R. "The idea of the two Eugenes being one is a bit staggering and mind-boggling" for his descendants, and even for me. Further investigation of the DNA matches shared by known Lynch and Corry descendants in different DNA databases has left little doubt that Eugene Curry became Eugene Lynch. We need to persuade these additional descendants to copy their results to GEDmatch so that we can add them to the Autosomal Matrix Comparison. One of these DNA matches turned out to be an adoptee, who has just been re-introduced to his birth family, as an accidental corollary of the search for Eugene Lynch. Submitting your DNA to a database has significant positive externalities for existing and future researchers. See here for all the technical details of how and why to upload your DNA data and pedigree charts to the various websites.